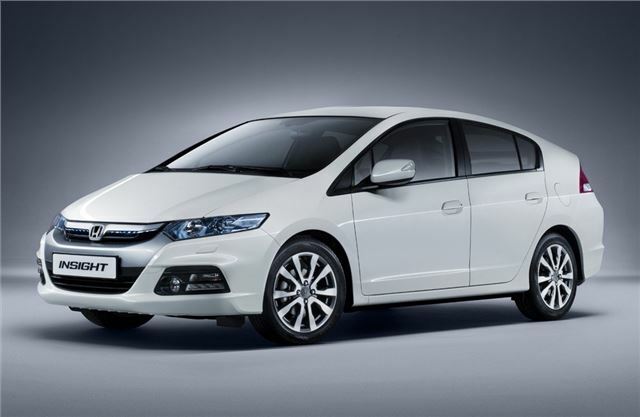 Honda will launch a revised Insight at the Frankfurt Motor Show in September 2011 with crucial changes that see CO2 emissions finally drop below the key 100g/km mark meaning exemption from the central London congestion charge plus zero car tax. The changes include reduced engine friction, changes to the CVT transmission and improved air conditioning. Combined these help CO2 drop to 96g/km from the previous lowest figure of 101g/km. As a result, the 2012 Insight qualifies for exemption from the London Congestion Charge and falls into the lowest VED band, meaning owners will pay no annual road tax. The new figures also ensure that Insight remains in one of the lowest groups for Benefit in Kind taxation. For 2012, the Insight gets an exterior refresh, including a new front grille. At the back, visibility is increased by the introduction of a slimmer spoiler and a smaller wiper motor. Adjustments have also been made to the engine and suspension for an overall improvement to ride comfort and stability, plus interior quality has been enhanced. This car looks great. Its design is indeed clean, making it a very compelling Honda car. I look forward to seeing this car in person.